When average school kid Ace McDougal gets fitted with braces, a mix-up at the dentist sees him catapulted into a world of super villains and hair-raising adventures. Wildlife expert Safari Bob gives a presentation at Ace's school. 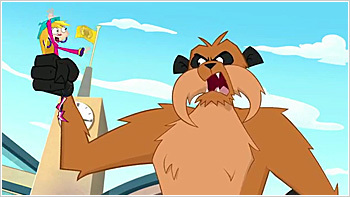 But a mishap with the Enlargerator Ray sees Ace transform a cute little monkey into a giant rampaging beast. Ace uses his braces Cohesive Manipulation Ray to bring a T-Rex skeleton back to life and take on Ned and Hilda in a battle of colossal proportions! While trying to remove a loose tooth, Ace accidentally loses his braces only to have them wind up on his loveable oafish dog, Lunchbox. 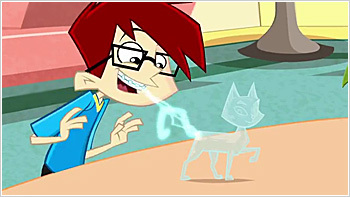 Ace has to catch up to his super powered dog, before Ned and Hilda can get their hands on him. When pro-skater Toby Squawk announces a local skateboard competition, Ace uses his braces to cheat and discovers he's skateboarded straight into Ned and Hilda's trap. 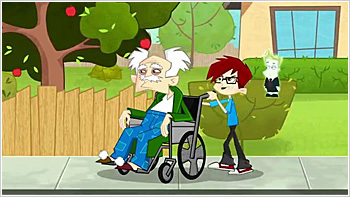 When Ace babysits his Grandpa, the forgetful old timer goes from annoying to awesome when he unwittingly rescues Ace from Ned and Hilda's clutches! Ace's dad Dougal plans to perform his embarrassing chicken act at Ace's school's benefit concert and Ace must find a way to keep his Dad off stage or face school-wide humiliation. When Ace ignores Hugo's advice and agrees to be sawn in half as part of Tina's magic act, he learns that sometimes — just sometimes, Hugo is right! Ace finally scores a date with Tina and takes her on a hot air balloon ride but when Ned and Hilda get involved, his dream date soon goes from heavenly to hair-raising. It's work experience day and Ace gets stuck working at the garbage dump but when Ned and Hilda pounce, Ace learns that local garbologists Vigo and Rigo have a few tricks of their own. 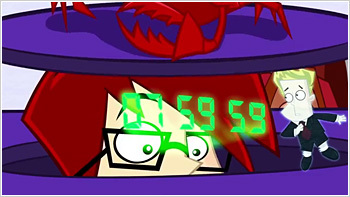 When Hugo's boredom reaches an all-time peak, the braces self-destruct sequence is activated and Ace has one day to make Hugo happy or the braces will detonate! After Ned and Hilda kidnap Ace's Grandpa, Ace must team up with his Grandpa's roommate super-spy extraordinaire Jack Union to save the day. When Ace accidentally breaks his mother's beloved crystal cat statue, he realizes that there is only one place he can find a replacement — Creepville Mansion. 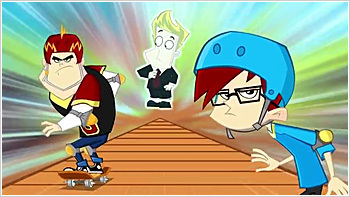 With the Mayor visiting Funpark High, Ace needs to be on his best behavior but a mysterious figure is doing everything he can to land Ace in detention. 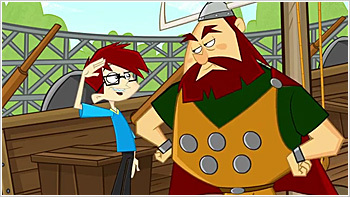 Principal Duffy takes the kids on an excursion to an authentic Viking Ship but it quickly spirals into mutiny and madness when Becky seizes control of the ship. Convinced she finally has proof that Ace is an alien, Becky plans to expose her brother to the world at Funpark High's Science Fair. She recruits world famous alien hunter Mr X to help her catch him, but Mr X has is even more mysterious than Becky knows. Ace sneaks his favorite Humungous Man action figurine along to a wilderness survival camp unaware that Ned and Hilda have programmed it to steal his braces. 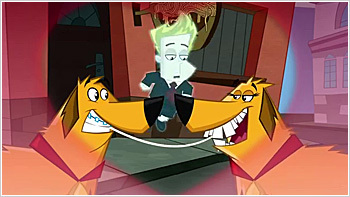 When Lunchbox loses all his fur in an unfortunate beauty salon accident, the unrecognizable dog is adopted by Mr Rainer and turned into a teeth-gnashing guard dog. 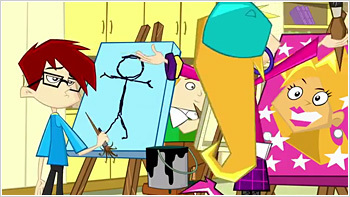 In an attempt to make Tina jealous, Ace gets Hugo to create a holographic girlfriend to bring to the valentines day dance. His plan backfires when the lovesick hologram becomes more than a little possessive. When Ace's teacher Mr Walker quits to reignite his rockstar career, super strict Mr Rainer takes over and Ace and Gordon team up to get their favorite teacher back. Ned and Hilda turn Ace's favorite video game against him by bringing all it's characters and monsters to life, but all Hugo cares about is meeting his celebrity crush, video game starlet Tara Tuff. When Becky tests her latest alien probe on Ace, Hugo splits into two, Nerdy Hugo and Cool Hugo. 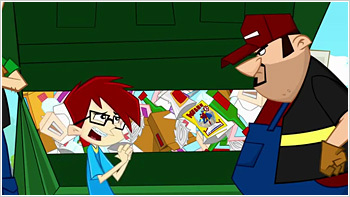 Now Ace must find a way to put his pal back together before Cool Hugo does away with Nerdy Hugo forever. A mysterious new girl arrives at Funpark High and is everything Ace has ever dreamed of but is she too good to be true? It's Hilda's birthday and Ned comes up with a diabolic plan to get his precious Mumsey the only present she really wants — Ace's braces . It's the annual Humungous Man Trivia competition and Ace has some serious competition in Anoop, a geeky exchange student who also has his eye on the Humungously awesome prize. After accidentally destroying Mr Rainer's savage robotic guard dog, Ace is on a madcap chase all over town to catch the one piece of evidence that could bust him... the dog's video collar. But Ace isn't the only one chasing it. 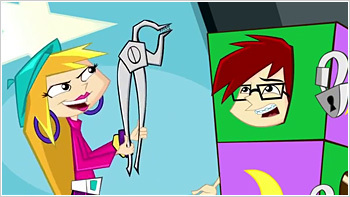 When Ned and Hilda trick Ace into brushing with a nanobot infused toothpaste, they gain total control over the braces and it's up to Hugo to defeat the uninvited mouth invader. Ace signs up to work at Burpy's Burgers charity day, planning to use his braces to help win tickets to boyband Bad Complexion's concert and score a date with Tina. A case of mistaken identity leads Ace to become the town hero but he soon finds out it's not as exciting as it seems. Ace and his eccentric Grandpa win a tour of the eccentric Billy Bonkers' wondrous ice cream factory but discover that Ned and Hilda have turned the whole building into one giant trap! It's Funpark High's big Halloween party but while fighting off Ned, Ace turns the entire crowd into drooling, brain-dead zombies! With Tina trapped at the top of Creepville tower, Ace sets off to rescue her but this time Ned and Hilda aren't the only ones waiting for him — so too are a hoard of angry Zombies. Ignoring his Grandpa's warning that a ghost haunts the dark tunnels under Funpark City, Ace and his friends set off on a spooky treasure hunt. 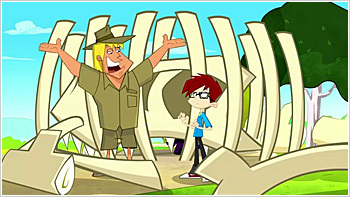 The McDougal Family is selected to be contestants on the hit game show "In Your Face" but when the director orders Ace to remove his shiny braces for the camera, Hugo finds himself alone in the jungle, with Ned and Hilda on his trail. Mr Rainer's favorite garden gnome has been destroyed and all the evidence points to Ace. Can he clear his name and find the real culprit before tough-as-nails Detective Hard Basket catches up to him? Hilda's adorable but evil nephew Egbert comes to town and quickly wins over the whole school with his irresistibly cute looks. But Egbert may not be as sweet as he looks. Now Ace must team up with a jealous Ned to stop this new pint-sized threat. Ace uses his braces to impress Tina and become the town's new superhero — Metal Mouth Man — but everyone knows that a good super hero needs an evil opponent and Ned and Hilda are only too happy to play their part. When Ace's bumbling leaves super-spy Jack Union unable to complete an important mission, Ace must step up and save Funpark City with a little help from some unexpected allies. When Ace's parents hire a high-tech holographic Nanny, Hugo is totally smitten by her. But when the love-struck holograms run away, Ace must chase them into a virtual world to try and get back his friend. A science lab accident turns Hugo into a real boy, and he couldn't be happier. He sets off to discover the world, leaving Ace to battle Ned and Hilda on his own. At Mr Walker's Air Guitar Camp, Ace takes the stage to show off his awesome skills but when his braces mysteriously eject into the frenzied crowd, he must find a way to get them back. When Ace accidentally brings a gargoyle statue to life, the terrified town folks set out to capture the mythical creature. Now Ace must find a way to protect his gentle new friend. When Ace wins the lead role in the latest Barry Plotter wizard movie, he is thrilled by his newfound fame until he learns that the part of Barry's arch nemesis Mouldy Warts is to be played by Ned! Ace tricks Becky into a wild UFO chase so he can get some alone time with Tina. But his prank backfires when he realizes he has sent his sister right into danger! It's Anoop's birthday and Ace gives him a ride in a space shuttle simulator. But when Ned and Hilda attack, Ace accidentally launches the shuttle and finds himself in space with a gang of super nerds, any one of whom could be Ned in disguise. Ace is outraged when his ticket to Humungous Man on Ice is stolen by a local cat burglar. So together with Athol, Claudia and Anoop, he sets out to track down the mysterious thief, unaware that the culprit is actually right under his nose. Tired of Ace and Becky's constant squabbling, Jeanie sends them to circus school for the holidays. But when Ned's latest scheme leaves them dangling from the high wire, Ace and his sister must finally learn to work together. Ace runs against Tina for school captain and discovers that high school politics is even more dangerous than battling evil super spies. Dougal enters Funpark City's gardening contest but when Ace tries to help, a mishap with his Enlargerator Ray results in a bad tempered 50-foot plant rampaging through the city. 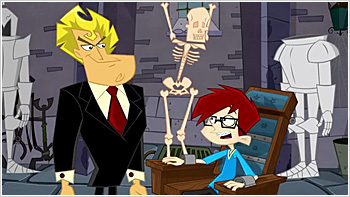 When the Mayor tries to steal his braces, Ace suspects that she has been replaced by Ned. But he quickly learns that Ned isn't the real mastermind behind the evil plot. 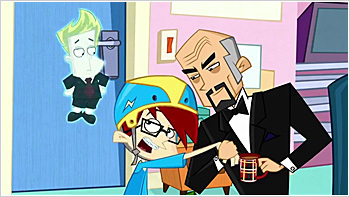 Professor Pringle updates Ace's braces, giving him a superior new hologram but Ace soon begins to miss his stuffy old pal Hugo and sets out to get him back. 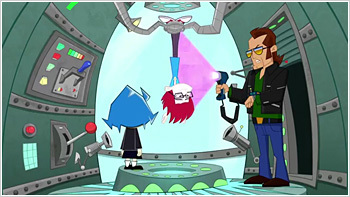 Jack Union returns to offer Ace a job as an official Junior Super Spy but first Ace will have to pass one final test. Things only get harder when Ned and Hilda cook up the ultimate evil plot to stop him.